All Gear's EZ Adjustable Safety Lanyard is a combination of a 16-Strand Polyester Climbing Line - your choice of Safetylite™, Neolite™, or Pro-16™ with a Steel Double Locking Snap combined with an 8mm or 10mm Friction™ Prusik (below) most commonly with a hook. 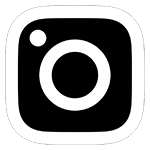 Quality engineering and construction are guaranteed by excellent quality control. The EZ Adjustable Safety Lanyard provides you with the ability to increase safety with an Adjustable Prusik. Available in 8', 10', 12', 20'. Custom Lengths Available. 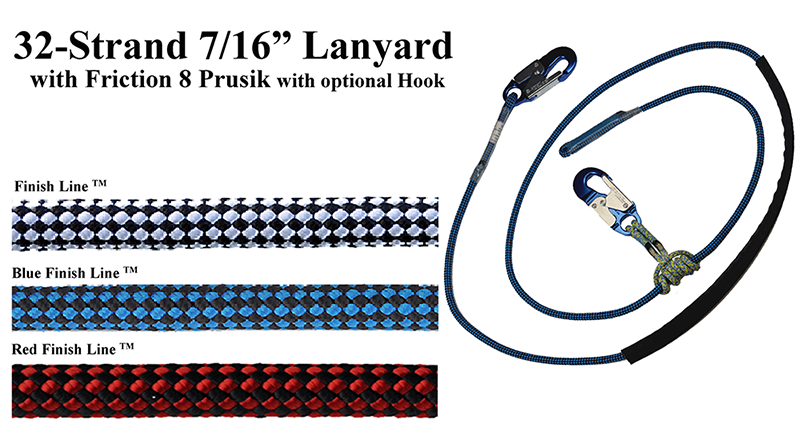 All Gear's EZ Adjustable Safety Lanyard is a combination of 32-Strand 7/16" Polyester over Nylon Kernmantle Climbing Line - Your choice of Finish Line™, Red Finish Line™, or Blue Finish Line™.with an Aluminum Double Locking Snap combined with a 8mm or 10mm Friction Prusik (below) most commonly with a hook. Quality engineering and construction are guaranteed by excellent quality control. 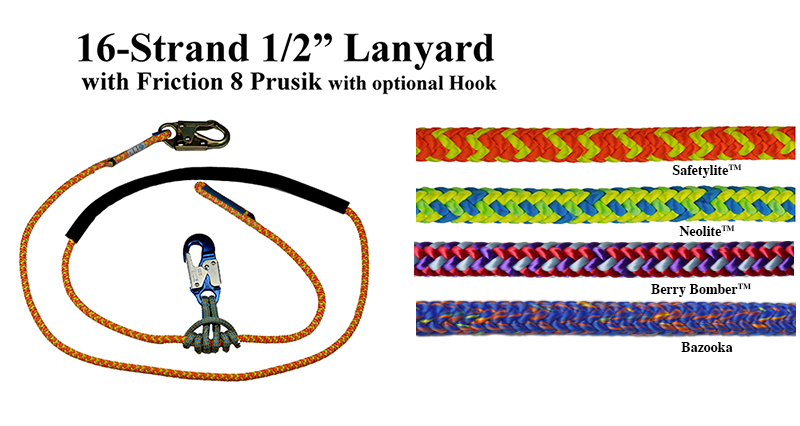 The EZ Adjustable Safety Lanyard" provides you with the ability to increase safety with an Adjustable Prusik. Available in 8', 10', 12', 20'. Custom Lengths Available. All Gear's EZ Adjustable Safety Lanyard is a combination of a 24-Strand Polyester Climbing Line - your choice of Rocket Line™, Blue Craze™, or Cherry Bomb™ with an Aluminum Double Locking Snap combined with a 8mm or 10mm Friction Prusik (below) most commonly with a hook. Quality engineering and construction are guaranteed by excellent quality control. 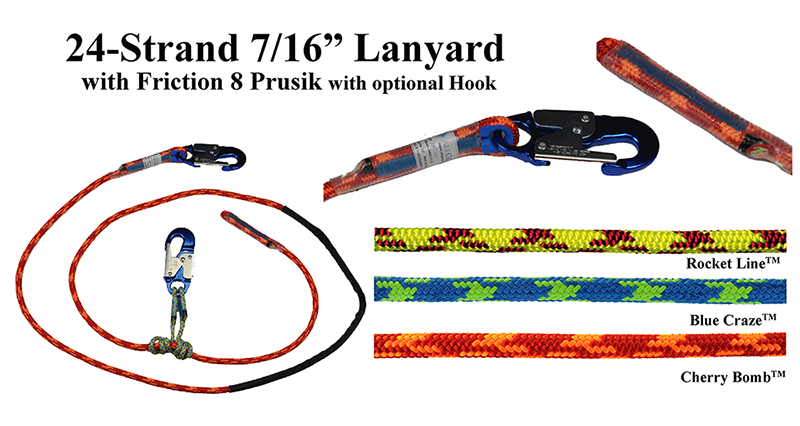 The EZ Adjustable Safety Lanyard" provides you with the ability to increase safety with an Adjustable Prusik. Available in 8', 10', 12', 20'. Custom Lengths Available. All Gear's EZ Adjustable Safety Lanyard is a combination of a 24-Strand Polyester Climbing Line - your choice of Mardi Gras™, Inferno™, Blue Craze II™ or Cherry Bomb II™ with an Aluminum Double Locking Snap combined with a 8mm or 10mm Friction Prusik (below) most commonly with a hook. 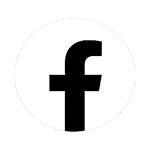 Quality engineering and construction are guaranteed by excellent quality control. The EZ Adjustable Safety Lanyard" provides you with the ability to increase safety with an Adjustable Prusik. Available in 8', 10', 12', 20'. Custom Lengths Available. Our Eye to Eye Friction Prusiks are a Double Braid Polyester and Technora over Vectran and are offered with an Optional Aluminum Double Locking Snap Hook. 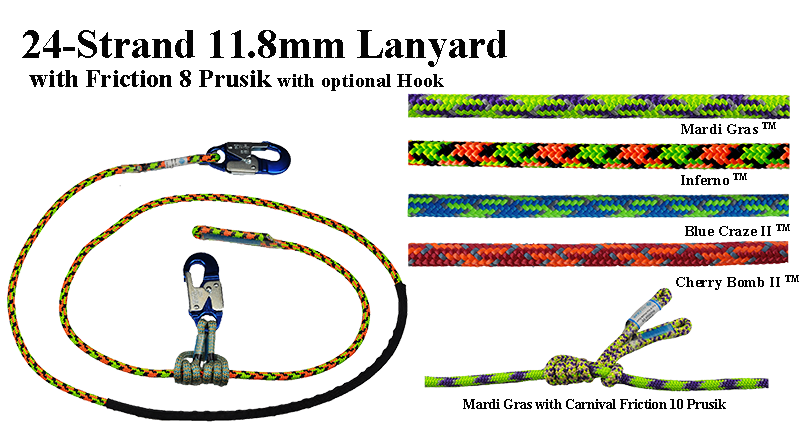 Select one of our Friction 8 and 10™ Prusiks to create your EZ Lanyard. Our Friction Prusiks are 8mm and 10mm Polyester and Technora Cover over a Vectran Braided Core. Quality engineering and construction are guaranteed by premium fibers and excellent quality control. The Friction 8™ and Friction 10™ provide you with the ability to increase safety and a good firm construction keeps the line round for high performance. Available in 26", 28", & 32" with or without hooks. 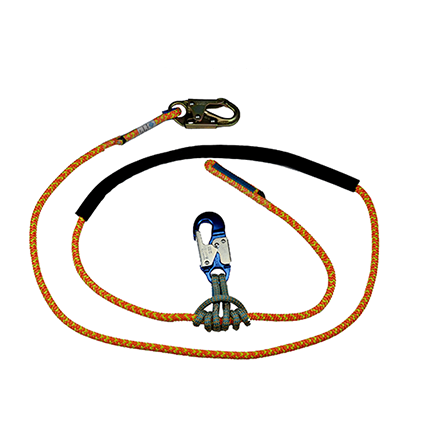 Meets ANSI Z133-2017 requirement for all climbers to use a lanyard as a secondary attachment.